Five days ago, I posted this Volkswagen ad in my facebook account. At that time, I'm sure its views haven't skyrocketed to millions yet. Apparently, this commercial made it to Super Bowl ads hence the insane 15+ million (no make that 16+ million now as of 2am) views. I posted it because 1) it was Star Wars and 2) it was really a cute commercial, unique even. Naturally, with success such as this, everybody will start asking "who was that boy behind the mask?!?". NBC's Today Show had an interview with the adorable boy named Max Page together with his mom, everybody was smitten with him. I know. 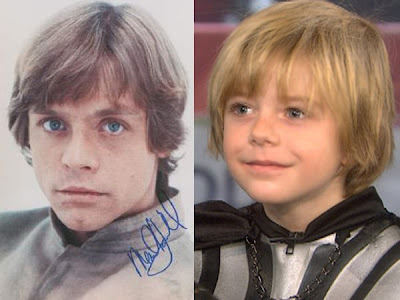 Max Page and Mark Hamill has an uncanny resemblance (as seen in the photo below), don't you think?